Military technology is capable of producing and manipulating massive hurricanes just like the one now brewing off of the east coast, a meteorologist told radio host Alex Jones. Weather control or geoengineering may sound like strange science, but it’s all very real. Scott Stevens, an award-winning meteorologist, says it’s being used to manipulate Hurricane Sandy. He also said every square mile in the Northern Hemisphere has its weather managed by geoengineering. Geoengineering is being used to create atmospheric conditions that will steer the hurricane toward New Jersey and lock it into place over the east coast, Stevens told Jones during Sunday's broadcast. Already, that prediction came true. 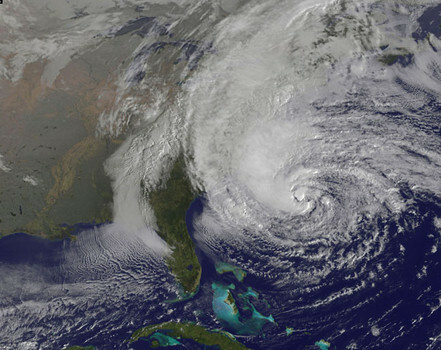 CBS News reported that the storm had turned and taken aim at New Jersey. Stevens predicted rain and flooding will cause the greatest storm damage. “Monumental” water damage will hit New Jersey, Delaware, Maryland, Southern Pennsylvania, the District of Columbia and northern Virginia and into New York State, he said. Weight from the water will cause trees to topple, tearing down power lines and causing outages that could last for up to two weeks. When the storm is over, the repair work begins. That will serve as a way to “soak” the economy. Instead of announcing spending for an economic stimulus, Congress will be paying for repairs and mopping up after the storm. Announcements of emergency declarations for Connecticut, New Jersey, Pennsylvania and Massachusetts were already rolling in via news alerts from the Department of Homeland Security. The declarations allow states to tap into federal funding to clean up after the storm. Weather weapons are just one more tool for the globalists to use against us, said Jones. Weather control has been going on for a long time, at least since the 1960s, said Stevens. Should we geoengineer earth’s climate? Scott Stevens (weatherwars.info), an award-winning meteorologist, has worked for many years as a television weatherman for KPVI News Channel 6 in Pocatello, Idaho. About 10 years ago, he began investigating the weather modification work conducted by Ret. Lt. Col. Tom Bearden, a nuclear engineer who maintains the weather is constantly being manipulated. Stevens has also worked in television in Topeka, Ks., Omaha Neb., Tulsa Okla. Albany, NY and Pocatello, Idaho.